We are transforming our safety culture and creating safe workplaces to eliminate accidents that result in lost work time and to ensure we never forget the lessons learned from the January 8 explosion. We are restructuring our workplace safety by preventing recurrence of fires and explosions, and improving workplaces that have high risk of serious accidents. We have also improved communication with in-plant operators, and have enhanced support systems by listening to any issues about work difficulties. During fiscal 2017, we carried out work safety inspections at accident sites in all our plants. 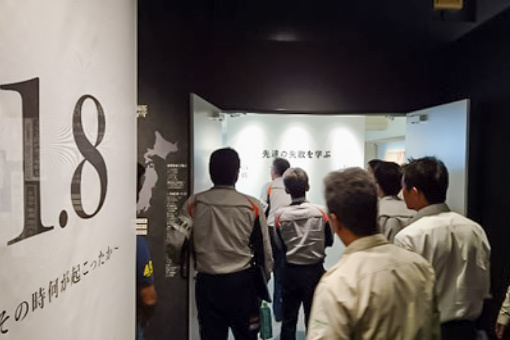 Led by the chairman and president themselves, this company-wide initiative was implemented to help prevent any recurrence of an accident by inspecting work procedures and offering advice following Toyota’s genchi genbutsu (on-site, hands-on experience) approach. We reassessed the risk associated with all of the company’s furnaces, we added interlock functions to all nonconforming furnaces, and we completed all measures to prevent recurrence of the January 8 explosion. We also continued our efforts to create safe worksites by ranking worksites according to risk assessments, and attempting to eliminate C and D rankings, the highest danger levels. As in last fiscal year, we tackled risks of being trapped or caught in equipment, the separation of people and vehicles, and prevention of electric shocks. As part of our efforts to enhance employee awareness of labor safety, we have created a facility for simulating danger, where employees can gain firsthand experience with the potential risks of day-to-day operations. Using dummy equipment to demonstrate the variety of dangers that can arise in the workplace, we work to enhance employee sensitivity to danger. To ensure we never forget the lessons we learned from the January 8 explosion, we continued using a furnace simulator training device in fiscal 2017 to enable workers to understand furnace mechanisms and experience their frightening power for themselves. We prioritize mental health, lifestyle-related disease prevention and health management support for employees assigned overseas, and systematically implement relevant initiatives. As a result, we were recognized as a Health and Productivity Management Outstanding Organization (White 500 category), in a program adopted by the Ministry of Economy, Trade and Industry and Nippon Kenko Kaigi. We work to maintain and promote the health of our employees, which is a priority issue for the company. 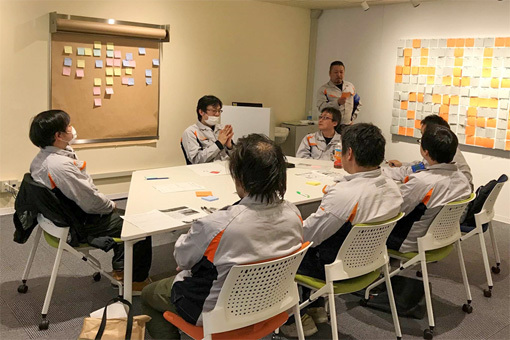 The Aichi Steel Group is working to maintain the mental health of its employees and prevent the development of mental issues, through various educational programs and individualized mental health care based on the results of stress check tests. During fiscal 2017, we also provided advice to workplaces that rated a high risk for mental health based on the results of these stress tests. We also collaborate with mental health consultants to offer ongoing on-site consultation* to ensure early detection and treatment of employees with mental health issues. * Mental health consultants visit our company once a month to provide two-hour consultations to interested employees who are experiencing mental health issues. The system we developed enables employees to discuss their concerns face-to-face with professionals.